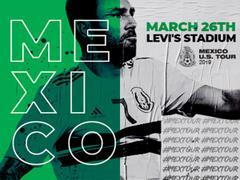 Mexico will take on Paraguay on Tuesday, March 26 at 7:00pm at Levi’s® Stadium. Event information can be found on the Levi’s® Stadium website at http://www.levisstadium.com. The Santa Clara Police Department attempts to distribute Traffic Advisories for major events at Levi’s® Stadium approximately 24-48 hours in advance of the event. Occasionally, event details require further attention which may cause delays in notifications to the public. Traffic Advisories can be obtained by subscribing to eNotify and/or Nixle.